This page provides information and instructions on how to utilize the Probe Measurement Kit. 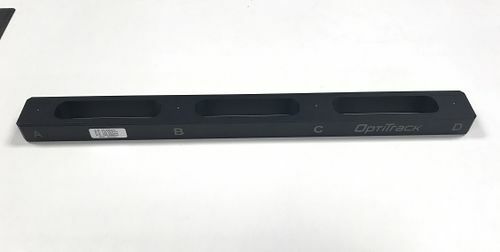 Measurement probe tool utilizes the precise tracking of OptiTrack mocap systems and allows you to measure 3D locations within a capture volume. 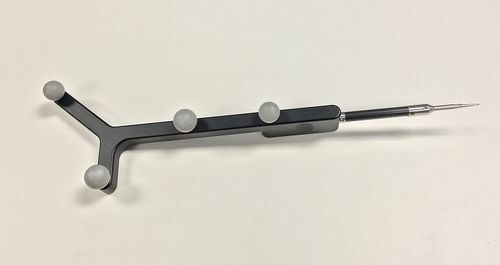 A probe with an attached rigid body is included with the purchased measurement kit. By looking at the markers on the rigid body, Motive calculates a precise x-y-z location of the probe tip, and it allows you to collect 3D samples in real-time with sub-millimeter accuracy. For the most precise calculation, probe calibration process is required. Once the probe is calibrated, it can be used to sample single points or multiple samples to compute distance or the angle between sampled 3D coordinates. Calibration block with 4 slots, with approximately 100 mm spacing between each point. Calibration block with slots for the probe tip. Open the Builder pane under View tab and click Rigid Bodies. Bring the probe out into the tracking volume and create a rigid body from the markers. Under the Type drop-down menu, select Probe. This will bring up the options for defining a rigid body for the measurement probe. Select the rigid body created in step 2. Place and fit the tip of the probe in one of the slots on the provided calibration block. Note that there will be two steps in the calibration process: refining rigid body definition and calibration of the pivot point. Click Create button to initiate the probe refinement process. Slowly move the probe in a circular pattern while keeping the tip fitted in the slot; making a cone shape overall. Gently rotate the probe to collect additional samples. After the refinement, it will automatically proceed to the next step; the pivot point calibration. Repeat the same movement to collect additional sample data for precisely calculating the location of the pivot or the probe tip. When sufficient samples are collected, the pivot point will be positioned at the tip of the probe and the Mean Tip Error will be displayed. If the probe calibration was unsuccessful, just repeat the calibration again from step 4. Once the probe is calibrated successfully, a probe asset will be displayed over the rigid body in Motive, and live x/y.z position data will be displayed under the Real-time Measurement section in the Measurements pane. The probe tip MUST remain fitted securely in the slot during the calibration process. Also, do not to press in with the probe since the deformation from compressing could affect the result. Under the Tools tab, open the Measurements pane. Place the probe tip on the point that you wish to collect. Click Take Sample on the Measurement pane. A virtual reconstruction will be created at the point, and the corresponding information will be displayed over the measurement pane. The sampled points will also be saved in the exported onto the project directory. Collecting additional samples will provide distance and angles between collected samples. Sampling 3D points using the measurement probe. 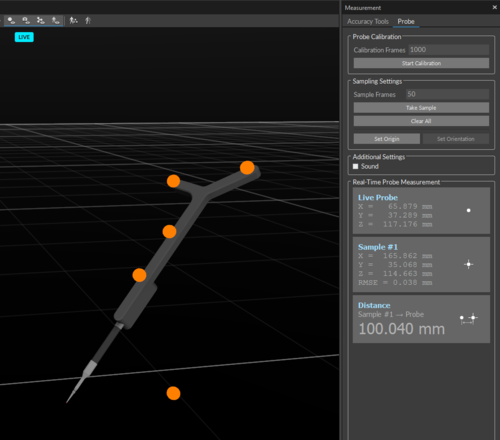 You can also use the probe samples to reorient the coordinate axis of the capture volume. The set origin button will position the coordinate space origin at the tip of the probe. And the set orientation option will reorient the capture space by referencing to three sample points. As the samples are collected, their coordinate data gets written into the CSV files in the project directory. 3D positions for all of the collected measurements and their respective RMSE error values will be saved in this file. Location of the probe tip can also be streamed into another application in real-time. You can do this by data-streaming the probe rigid body position via NatNet. Once calibrated, the pivot point of the rigid body gets positioned precisely at the tip of the probe. The location of a pivot point is represented by corresponding rigid body x-y-z position, and it can be referenced to find out where the probe tip is located. This page was last modified on 29 May 2018, at 12:23. All data and information contained in or disclosed by this wiki is proprietary information of NaturalPoint Corporation and all rights therein are expressly reserved. By accepting this material the recipient agrees that this material and the information contained therein is held in confidence and in trust and will not be used, copied, reproduced in whole or in part, nor its contents revealed in any manner to others without the express written permission of NaturalPoint Corporation. Information in this document is preliminary and subject to change and does not represent a commitment on the part of NaturalPoint Corporation.